This is a mini ventriloquist doll couple. The man and woman are each 3 inches tall at the tips of their fingers. 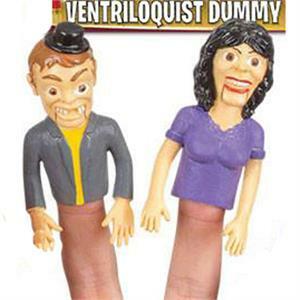 The mini ventriloquist dummies are hollow, pliable plastic so can be used as finger puppets. The style of the wife and husband varies. These mini ventriloquist dolls are recommended as as sandtray / sandplay figures or for more general play therapy.